The first permanent building at NKU. An account of who the NKU buildings are named for, at the NKU site here. 19 Modern Rooms with bath. Members of AAA and Quality Courts United Inc.
“In an effort to improve the area's roadways, residents attempted to incorporate in 1927. The actual incorporation, however, had to be delayed until a baby was born, giving the area the 125 people needed to become a city.” Jim Reis, in the Kentucky Post, May 9, 1993. 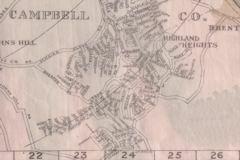 This is Highland Heights in 1937.